BLACK FRIDAY 24 HR SPECIAL: Buy 2 Women's Faith hoodies and get 20% off at checkout, 3 and get 25% off, 4 and get 30% off. 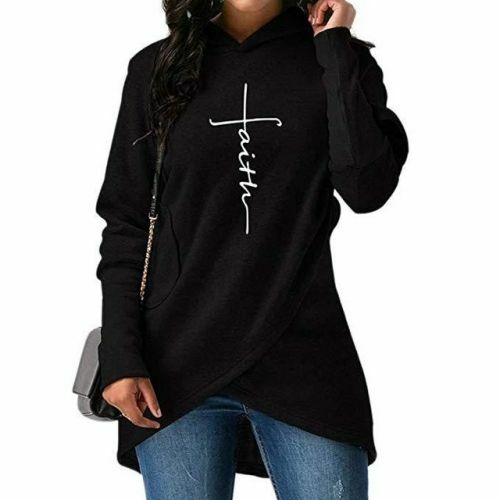 Our Women's Faith Hoodie Is Not Only Flattering For Any Shape, But Soft And Comfortable Too! Designed in California. Its unique Style AND Embroidered Message Will Be Sure To Turn Heads! You'll be surrounded by the warmth of its design... and your faith as well! It Comes In A Variety Of Sizes, Four Colors AND Because It's Made of a Poly-Cotton Blend, It Washes Well!